What's the minimum frequency (speed) can a VFD run? What really happens with a variable frequency drive (VFD) / variable speed drive (VSD) and the actual frequency that is imposed on the electric motor terminals? For induction motors, it is never 0 Hz. For synchronous motors - it can be DC / 0 Hz - but this is only in the case of Permanent Magnet Synchronous machines, and motors with Wound Fields that have the ability to supply significant Current into the wound fields at standstill. I am not going to discuss synchronous motors further because I suppose the question is related to AC Induction motors - specifically Squirrel-Cage machines. Most importantly: no induction motor will deliver any torque at standstill with zero hertz applied to its stator. Zero hertz is DC, which by basic definition of induction will produce no induced currents or voltages in the rotor, and hence no torque. What happens in the case of Direct Torque Control - and other Vector Control methods - even some without motor feedback - is not 0 Hz / DC. It is actually a low frequency of a fraction of a Hertz, to several Hz - depending on the size of the motor (VFD) and its rated slip. The choice of frequency is a compromise between effective induction on the rotor, and minimum magnetizing current (higher frequency) - and operation in the right part of the (reduced starting frequency) torque-speed curve (lower frequency is preferred). 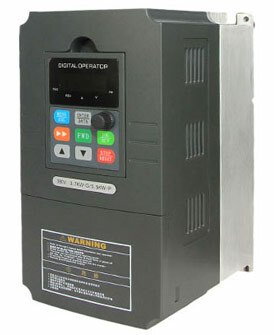 A variable frequency drive will even achieve considerable zero-speed starting torque in open loop / scalar connection. One very interesting factor that limits the low frequency limit of a VFD is the cooling of the individual power switching devices. If the frequency is so low (0.1 Hz for example) that each phase switch will remain on for its portion of the waveform - this phase's switching devices will overheat (for normal and even very large water-cooled VFDs). But the fact of the matter is that a PWM VFD will drive a motor fairly well at all frequencies within practical limits. Non-PWM VFD's will have torque pulsation issues at frequencies lower than about 6 Hz, but PWM devices (and DTC for example) will be able to control an Induction motor at very low speeds, down to standstill (provided the motor is able to cool effectively). can i run the VFD at 5HZ ? Hope you are doing well and in good health..
Kindly help on this that which parameter i have to adjust to achieve 6HZ operation..